The beautiful cream of Vegan with raspberries and fries is soft, creamy, filled with pieces of chocolate and protein from the blinds! 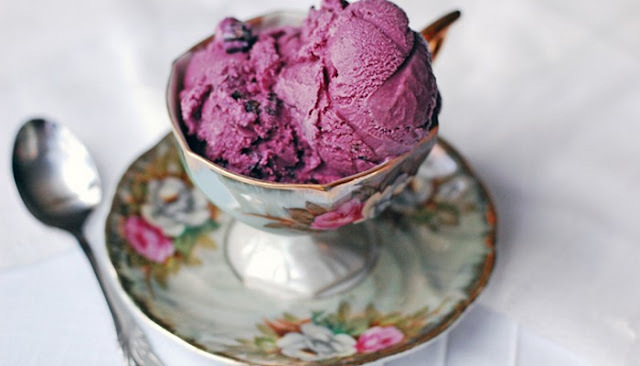 I scream, you scream, we all cry for a delicious vegan protein cream made from black raspberry! After a deep sigh, of course, because it is a long title. First and foremost, I come from Ohio, if you are a newcomer and you did not know it (also, Hello, I'm glad you're here!). Ohio is pretty good, except the cold winters, the winters. Anyway, the state of Ohio is clear, which you first come to mind. Horse chestnut for life, honey. The second best in Ohio? Graeter's ice cream. At least Sara, 12, you will say that. The one of Graeter’s, who always went with my family, had a place to play, like the style of McDonald's, only with class. Imagine a split plantain-swing (I KNOW), two large slides and a MASSIVE cone of black raspberry ice (about 20 feet high) with a cut-out tunnel so you can literally walk through the icicle. It was the air version of all children. A place to eat ice cream and then run until you are tired, or probably until you feel sick, eat ice cream and then run like a psychopath in a wonderland of ice. Apart from the location, Graeter is known for his incredible ice cream. They have tons of really classic flavors, but I think they are definitely better known for their black raspberry chip. A sweet, creamy and fruity ice cream with pieces of chocolate the size of your face. Fortunately for my health, I no longer meet Graeter’s. But fortunately for my health, now I have this vegan cream of black raspberry protein. This beautiful bowl with purple beauty consists of only 4 ingredients. As always, cheers for easy! Mix the frozen berries, almond milk and proteins from the sun. Sunwarrior has been my favorite protein brand for years. Since I've been working on plants, I have NEVER found another vegetable protein powder that has the flavor, texture and quality of comparable ingredients. I always go with the warrior-mix, which is raw and contains a ton of high-quality vegetable proteins and which is naturally sweetened with stevia. There are no artificial, unhealthy ingredients here! I use the Sunwarrior protein as the most important ingredient of the most popular recipe on my blog! I've used it lately in these protein bars (they taste like peanut butter cups! ), But I also use them regularly in pancakes, waffles, mini-cuties and do not bite in the oven. That is one of my favorite things about Sunwarrior. It is a bit sweet and therefore easy to process in most dessert recipes. It is well baked, but it is also delicious. My preschool breakfast during the week is a chocolate protein with bananas, and it never disappoints. By the way, NOTHING is worse than about 3 minutes of hunger after eating. Sunwarrior always keeps me happy until my next meal and the chocolate taste is just an advantage! So, today my beloved Sunwarrior Chocolate Protein appears in this delicious vegan black raspberry cream. Because the protein offers a surprising texture, thick and creamy, there is no need for a frozen banana, but if you want it even thicker, take one! This recipe is included in your mixer in seconds. All you have to do is add large chunks of chocolate without sugar and milk to spread the sweetness of the fruit. You need this beautiful black raspberry protein vegan cream in your life. 1. Mix the berries, egg whites and almond milk in a powerful blender until soft and pour into a large bowl. 2. Add the chocolate pieces and freeze for 2 hours. 3. Put the cream in a bowl, cover with more pieces of chocolate and serve! However, if that is not an option, you can buy coconut milk online and coconut cream online here. What happens if I do not have an ice machine? I get this question from time to time. Honestly, my first answer is: get an ice machine! Seriously If you like coconut ice and you think you will do it regularly, an ice cream factory is an investment of 100%. I replaced it with this new model, which makes me very happy. My family loves ice cream, and since Jesse can not eat sweetener except honey, our only option is homemade ice cream. Have you seen the cost of coconut ice in the store? But if I have not persuaded you, here is a contribution from The Kitchn about how to make an ice machine without a machine. Try some of their ideas and see what you think. I have not tried any of these methods alone, so I cannot say how well they will work for this particular recipe. 1. Add coconut / milk, honey and vanilla cream to your blender and mix until all ingredients are well mixed. 2. Pour the mixture into your refrigerator and start processing.